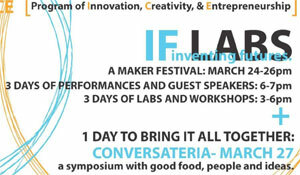 Organized by Lynn Book and students in her entrepreneurship and social enterprise class and as part of the 10 Year Celebration of ICE, IF LABs is a week-long festival from March 24-27 designed to shine a light on acts of making – and even what making itself means – here, now and into the next. True to form, this boundary expanding event reflects the rigor and inventive energy that ICE and Wake Forest has become known for, and invites the campus and community to experience a fresh palette of creativity and innovation towards inventing futures shaped with imagination and purpose. Any and all creative explorers can sign up for micro labs and hands-on workshops, to see performances, and to join stimulating discussions about 21st century creativity with a diverse mix of students, faculty, community members, staff and featured national and international guest ‘provocateurs’. In one, two and three hour time slots, participants will have the opportunity to design and build, improvise and perform, make a scene and make a plan. Local leaders and global visionaries will engage methods and techniques from ancient to contemporary, digital to experiential, improbable to entrepreneurial. You will also encounter performances, artist talks and demonstrations that are sure to inspire. The Wake Forest, Winston-Salem and larger communities are welcome! Click here for more information. Register for workshops here. A complete schedule with workshop locations is available here.